Purple basil (Ocimum basilicum purpurascens) is one of four common types of basil you'll often see in a backyard. It thrives as an annual throughout U.S. Department of Agriculture plant hardiness zones 4 through 10. 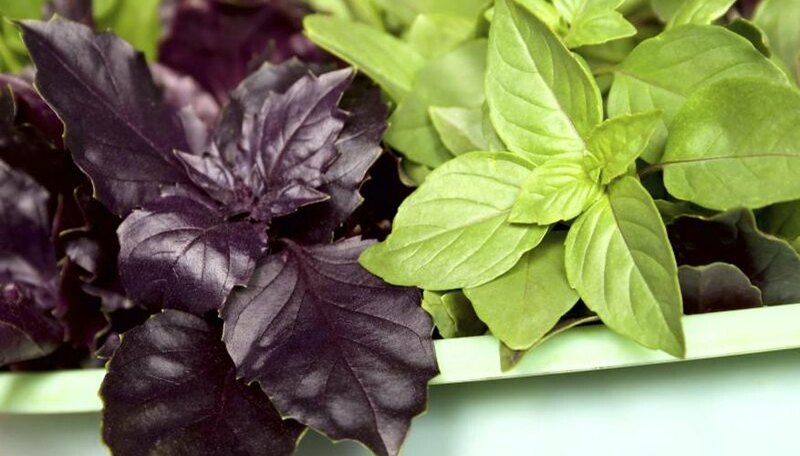 Compared to the more common sweet basil variety (Ocimum basilicum), purple basil has darker, more richly hued foliage with a slightly more pungent flavor. Add a dash of vibrant color to your landscape and a pinch of exotic flavor to your meals with this twist on a traditional herb garden standby. Like other types of basil, purple basil is relatively low maintenance. However, it's very picky about sunshine. For the biggest, densest purple basil shrub, choose a location that receives full sunlight -- this means a minimum of six hours of direct sunshine every day. This is often on the east- or west-facing sides of your home. Whether you're growing your basil in the ground or in containers, wait to set your purple basil outdoors until after the last frost date in your region has passed and outdoor evening temperatures remain above 60 degrees Fahrenheit. Break up the soil to a depth of 6 to 8 inches, remove all debris and mix in a couple inches of well-aged compost to improve fertility and drainage. Purple basil thrives in well-draining soil that's rich in organic content. Shallowly sow your basil seeds just 1/8 inches deep, burying the seeds in a row with the seeds almost touching. Water twice a day or as necessary to keep the soil moist until the seedlings emerge, typically within a week after sowing. Once the purple basil seedlings produce a full set of leaves, thin the row. Remove all but the strongest and tallest seedlings, plucking out the weaker, smaller plants and leaving approximately 12 inches between each remaining plant. If you're short on backyard gardening space but have a sunny patio, basil and other herbs thrive in containers. Use a 5-gallon plastic or ceramic pot with drainage holes on the bottom. Fill the pot with a sterile soilless potting mix, as container-grown purple basil doesn't do as well in pots filled with backyard garden dirt. Sow three or four basil seeds just 1/8 inches deep in the middle of the pot, and water twice a day to keep the pot moist. After the seedlings have developed a full set of leaves, thin the pot so there's just one plant per pot by removing all but the strongest, tallest purple basil seedling. After the purple basil is established, water it about once a week. Container-grown purple basil may dry out faster than in-ground basil because the pot is exposed to sunlight and air at all sides. Monitor the potting mix. If it looks crusty or flaky at the surface, it's time to water your pot. For in-ground basil, use enough water to moisten the soil to a depth of 8 to 10 inches. For purple basil in pots, add water until moisture appears in the drainage holes at the bottom of the pot. In most cases, purple basil doesn't need fertilization except in the most infertile of locations. The soilless potting mix in the container, or the compost you added to the ground when you first planted the herbs, is often enough. However, optional fertilization can enhance plant health and make the purple basil shrub produce more of its flavorful foliage. For in-ground purple basil, apply any standard 5-10-5 vegetable garden fertilizer approximately one to two months after planting. Use 1 1/2 ounces of 5-10-5 fertilizer for every 5 feet of gardening row. If you have a container-grown basil plant, use a liquid 12-4-8 houseplant fertilizer. Combine 1/2 teaspoon of fertilizer in a gallon of water and use the solution as a replacement for your standard watering. Repeat every four weeks for your potted plant.